Mention classic tube microphones to anyone, and the 1960s-manufactured Telefunken ELA-M 251 will almost certainly come up. And you can tell it’s a desirable microphone by the number of reissues and clones that have been introduced over the last 20 years. 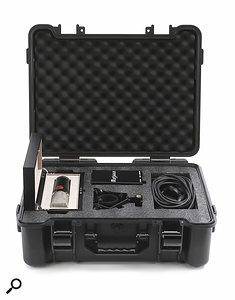 The mic and PSU ships in a rugged carrying case and comes with a shockmount and cable.Two years ago, David Royer (Royer Labs, Mojave Audio), who has designed modern classics such as the Royer R121 ribbon microphone and the multi-pattern tube Mojave MA-300, began working on his version of the ELA-M 251. With the release of the Mojave Audio MA-1000 in late 2016, Royer has produced one of his best designs: a classic-looking, large-diaphragm tube condenser that boasts a lush 251 character, yet is modern in terms of its low noise and sonic detail. Like the original Telefunken ELA-M 251, the MA-1000 is suitable for every kind of musical instrument: vocals, acoustic guitar, piano, overheads, horns, violin or an entire orchestra. In my book, its smooth, accurate persona, plus listenability, make it one of the best new microphones in years. 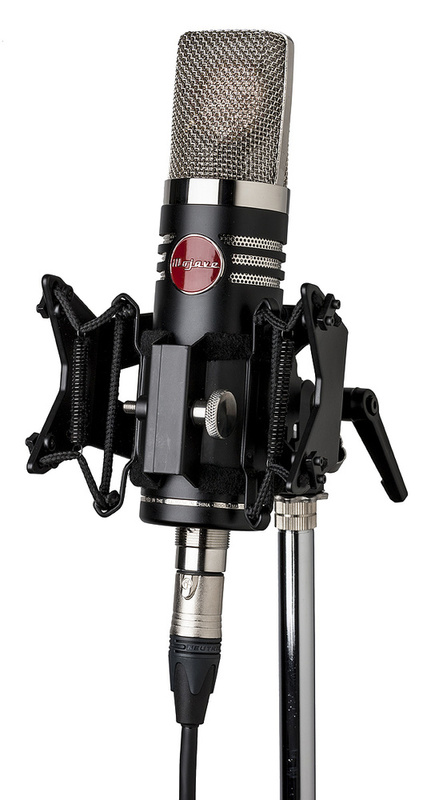 The Mojave MA-1000 is not one of those low-cost import mics that flood the USA market each year. 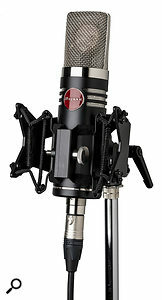 This is one serious microphone, with a suggested list price of $2795£2640. The MA-1000 employs a Chinese-made capsule and an original, new-old-stock 5840 tube with a custom-designed transformer built by Coast Magnetics. The mic’s modern bling includes a continuously variable polar pattern, a pad and a bass roll-off for up-close work. Final assembly of the MA-1000 is done in Burbank, California. The unit comes with a quality suspension microphone mount, a deluxe carrying/storage case, power supply and a Mogami cable. The polar patterns are adjusted via the power supply-mounted controls. David Royer said he had a 251-influenced design in his head for a long time, and decided, based on customer interest, to produce one with his own unique twist. “When I decided to revisit the Telefunken ELA-M 251, I checked out several available copies of the original AKG CK12 capsule until I found one that I was happy with,” Royer explained. The Chinese-made capsule is faithful to the original CK-12 used in the Telefunken ELA-M 251; it is three microns thick, and Royer has noted that he is pleased with the quality consistency. “The Chinese factories that are manufacturing copies of Neumann and AKG capsules have, in several cases, redesigned them somewhat to simplify the manufacturing process,” he said. Royer went a different route when designing the tube circuit of the MA-1000, opting out of the typical clone’s use of the 6072 tube. “I decided to design the electronics, more or less, to follow the design of the German-market 251, using an AC701 tube, rather than using a 6072,” he explained. Another key to the MA-1000’s sonic performance is the output transformer. Royer apparently brushed the dust off of an old prototype he had made 20 years ago, but which hadn’t yet appeared in a commercial product. This prototype was compared with a number of other transformers and identified as being the best performer. Whatever design decisions were made, the result is a 251-style mic that is one of the best modern takes on the venerable classic that I have ever heard (along with the ADK TC-251, which first used this particular capsule). Some of the clones are faithful to the vintage tone; others are pretenders that are thoroughly modern with a bit too much ‘zing’ for my taste. The MA-1000’s sonic character is quite clean and accurate, with just enough warmth to keep everything sweet — without excessive bloat in the mid-bass and mid-range. Looking at the factory frequency response graph, the cardioid response is amazingly flat for a large-diaphragm mic, with maybe 2dB variation in the mid-range and lower treble. It is almost dead flat to 10kHz, and the 12 to 20 kHz region has less roll-off than many other large-diaphragm mics on the market. In setting up the review, I mated it with two microphone preamps: the all-tube, USA-made, DW Fearn VT-1 single-channel unit and the (also USA-made) True Engineering P2, which is one the cleanest, quietest mic preamps I have ever used (now only made in an eight-channel model). In individual recording sessions with the MA-1000 I connected the mic to the preamps using a Wireworld premium professional XLR cable and then ran an additional Wireworld cable to the Benchmark ADC1 A-D converter. The converter was linked to a Tascam DA-3000 in dual-mono mode, and set to 24-bit/192kHz PCM recording mode. The True P2 is a clean-as-a-whistle, very neutral mic pre that excels on transient-rich instruments. The VT-1 has that classic tube body with a rich, smooth body. There is hardly a modern tube pre that can touch it when it comes to voice-overs, vocalists and choirs. Mojave President Dusty Wakeman said the MA-1000 was an impressive piano mic, so I first tried it on my 1975 Yamaha U1 upright piano with the True P2 pre. I recorded the U1, using a mic boom with the MA-1000 mounted over the piano’s open top cover. By positioning the mic about 12 inches from the top, I obtained a good balance of bass and high end (though the U1 doesn’t have much low bass). I recorded in both omni and cardioid modes. I played several songs with both high- and low-register emphasis on the piano to give the MA-1000 a workout. In particular, I wanted to hear if the mid- and upper-frequency notes were hyped. I went back to the DA-3000 playback and listened through my AKG K702 headphones. The piano sounded dynamic, clean and, most importantly, smooth in the transients of the high-register without any harsh overtones. Never has the U1 sounded so good in a recording. The recording sounded bright, as Yamaha U1s do, but with none of that extra emphasis that can make trebly pianos sound too sharp. The combination of the mic pickup and the accurate recording path allowed me to hear the natural room reflections and bits of reverb decay from inside the piano. And this was with one mic — I would love to hear stereo recording with a pair of MA-1000s. The omni mode revealed more of the reverb from the left side of the room near a set of solid oak steps than I would have liked. It was just the nature of the room setup; the cardioid pattern, in this particular case, sounded better to my ears. I then moved from piano to acoustic guitar. I have used various ELA-M 251 derivative mics over the years and have found them suitable for acoustic guitar but, depending on the make, they often required careful placement, use of the bass roll-off and sometimes some EQ to tame the bass emphasis — especially on Martin Dreadnoughts. This is where the MA-1000 really shines. If you look at the cardioid bass response, it is essentially flat to 20Hz, offering amazing bass clarity for a big condenser. Mounting the MA-1000 a foot away from my Martin J-40 jumbo at the 12th fret, I set the pattern mode to cardioid and recorded a number of finger- and flat-picked runs. The J40 is not as boomy as a dreadnought, but some big condensers add bottom-end emphasis that makes it seem muddier than it really is. The Mojave MA-1000 handled the Martin’s prominent mid/bass perfectly, while the mid-range and lower treble, as picked with phosphor bronze strings, came through succinct and true, without adding any presence or crispness, which is an all-too-frequent character of many modern mics. I could not have been happier as I listened to the playback. Ditto on a recording of a Manuel Rodriguez solid cedar-top/Indian rosewood classical guitar. Intricate note playing was well balanced and very quiet. I have heard many tube mics hissing during low-level classical guitar playing. Not with the Mojave — it is very quiet. Switching to electric, I recorded my Gibson L5 CES Custom jazz guitar, played through an original 1965 Fender Deluxe Reverb amp. The result was the best recorded sound I have ever heard with this rig! That warmth, expressive L5 humbucker tone, combined with the warm character of a Fender with 6V6 tubes in a push-pull circuit, came through without any extra bass emphasis. It is a tricky amp to record with big jazz boxes and big condenser mics — without some adjusting of EQ or rolling off the bass in the recording chain. But with the Mojave MA-1000 and careful placement, I just dialled back the Fender’s bass roll-off pot a few ticks to get the clean, warm sound that I wanted. I never engaged the mic’s roll-off for the L5 session. I had no drum cymbals to record, but I did have some castanets and tambourines that I gave a workout before the MA-1000. Based on the response graph, I assumed the top end would sound good, but it was really refreshing to hear the MA-1000’s smooth, linear presence and high treble. No hard, crisp punchiness on the tambourine; it sounds like a tambourine! Reports from other users assure me that cymbals will get the same treatment. It’s undoubtedly a big mic, and don’t they get used for voice recording? Yes, they do, and so does the MA-1000. I am no real singer, but I sang a few tunes, plus read some narration, and recorded in 24-bit. This time I used the DW Fearn VT-1 as the mic preamp. At a distance of about eight inches, the Mojave again shows its true colour, or lack of colour. With the bass roll-off switched off, the vocal spectrum is even — without mid/bass emphasis or any excessive sibilance, which distracts from the true essence of the voice. And the Mojave picked up the little bits of the room reverb and decay that mixed with the voice. Although it is a tube microphone, the MA-1000 is a great mic for hi-res recording because of its ability to capture that fine, subtle detail that is just above the noise floor. In fact, its ability to find the inner-detail of transient sounds on the strings and piano remind me of the really good, small instrument mics — only the MA-1000 has a bigger, smoother soundfield. A tube pre and a tube mic can sometimes be too much of a good thing. Coupling it with the DW Fearn tube VT-1 preamp augments the tube signature of the microphone, but is not overly fat or ‘slow’ in its character. I was impressed with the recorded audio from the mic/pre tandem. I can’t think of a better vintage/modern tube mic than the Mojave MA-1000. This Mojave large-diaphragm condenser may be the champion in combining the old-school tube character with a linear, detailed, modern flavour that allows for recording in hi-res. Like the original Telefunken and AKG C12, I am sure the MA-1000 will be used for numerous instrument and vocal applications. It is, indeed, that good. There are a number of 251-inspired mics on the market, and at a variety of prices, but they all differ in terms of their combination of capsule choice and circuitry. Options to consider include the Peluso 22-251, Bock Audio 251, Telefunken ELA M 251E, ADK-TC 251 and Lawson L-251. Good for variety of instruments. This USA-assembled, large-diaphragm condenser is a top choice, combining old-school tube character with a linear, detailed, modern flavour that allows it to work with any kind of instruments and vocals.